Believing the lie that we do not require forgiveness causes us to rely on a deception that will ultimately disappoint. As Lewis wrote, “a man who admits no guilt can accept no forgiveness” (The Problem of Pain). In the United States we have a sad propensity to worship celebrity. Famous people possess an allure that many find irresistible. I suspect most famous people recognize fame’s fickle and fleeting nature. Some avoid the dangers of fame’s flames, but many rush headlong into the furnace. Some allow the illusory nature of celebrity to deceive them into thinking they rise above the concerns of normal human beings. Why, you might even find one of them professing to be a Christian while denying the very core of the faith. It is vitally important for all of us to understand that (1) we need forgiveness and (2) God is eager to extend it to us. It is second nature, for example, to orthodox Lutherans. Lutheran preaching is based on the Law/Gospel dialectic. While it’s often short on the “How Then Shall We Live?” counsel, it goes to great lengths to avoid any intermingling of the Law and the Gospel. This sharp divide between the two is proclaimed throughout the Scriptures, but clearly seen in the following passage: “For the wages of sin is death, but the free gift of God is eternal life in Christ Jesus our Lord” (Romans 7:23). A proper understanding of the Law, and our sinfulness, lays the solid foundation for understanding the Gospel. It declares we cannot—under any circumstances—rescue ourselves. “None is righteous, no, not one; no one understands; no one seeks for God. All have turned aside; together they have become worthless; no one does good, not even one. . . . But now the righteousness of God has been manifested apart from the law, although the Law and the Prophets bear witness to it the righteousness of God through faith in Jesus Christ for all who believe. For there is no distinction: for all have sinned and fall short of the glory of God, and are justified by his grace as a gift, through the redemption that is in Christ Jesus, whom God put forward as a propitiation by his blood, to be received by faith. (Romans 3:10-12, 21-25). Or, as the Apostle John cautions us: “If we say we have no sin, we deceive ourselves, and the truth is not in us. 9 If we confess our sins, he is faithful and just to forgive us our sins and to cleanse us from all unrighteousness. 10 If we say we have not sinned, we make him a liar, and his word is not in us” (1 John 1:8-10). In one of Lewis’ most amazing books, The Great Divorce, he addresses a common excuse for atheism. How could a loving God allow Hell to exist? He illustrates with a number of fascinating vignettes the sad truth. There are only two kinds of people in the end: those who say to God, “Thy will be done,” and those to whom God says, in the end, “Thy will be done.” All that are in Hell, choose it. Without that self-choice there could be no Hell. No soul that seriously and constantly desires joy will ever miss it. Those who seek, find. Those who knock, it is opened. My favorite encounter in the book involves a liberal, atonement-denying theologian, but there is another that perfectly illustrates the point of this column. One of the lost souls has been approached by a redeemed saint who attempts to persuade him to continue journeying towards the presence of God. It so happens that the “ghost” (as the insubstantial disbelievers are called, knew the forgiven man while both were alive. And the redeemed person had committed murder. The perceived “injustice” of the forgiveness of that sin only reinforces the intransigence of the ghost towards God’s mercy. Every time I read those words I am reminded of the truth that I am not a perfect man . . . I don’t want to pay the price the Law demands . . . I want, and need, to receive the bloody Charity of God that flowed from the wounds of my Lord on Golgotha. It is my hope and prayer that you share this joy with me. * Yes, I realize it was based on a British show with a similar title; that may suggest that some other Western nations succumbed even more dangerously to secularism than America. Talent competitions make fine entertainment, but a little more thought should have gone into naming the two series. ** Ironically, this individual professes to be Presbyterian, and I am confident that if Calvin were still alive, he would have a few facts he would like to teach him. Yes, you read the title correctly; it’s no typo. Africa itself arrived in America this summer—and it’s an event that apparently takes place every year! In a recent post by one of Mere Inkling’s earliest subscribers, I learned about the annual Saharan Air Layer. 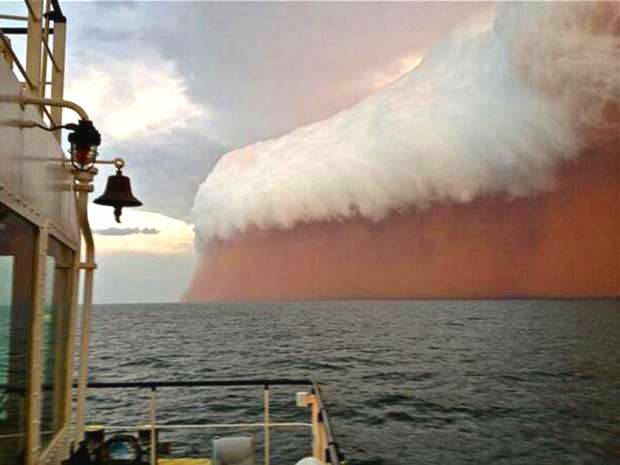 It is an enormous dust cloud that transits the entire Atlantic Ocean and is vital to the western hemisphere, especially the Amazonian rain forests. More about the SAL below. I find this phenomenon fascinating. It reveals how intricately balanced and interconnected God has created this amazing ecosystem we call earth. I appreciate this fact, even though I don’t consider myself an environmentalist. That doesn’t mean, of course, that I don’t recycle. What’s more, I would actually like to see brazen polluters incarcerated and tasked with personally cleaning toxic waste dumps . . . but that’s not the theme of this reflection. It seems to me that part of being truly human, is possessing an appreciation—or even a love—for the world in which our Creator has allowed us to dwell. By love, I mean a deep affection for the flora and fauna, and even the mountains and valleys themselves. I am not proposing idolatry. I am in good company in valuing nature. C.S. Lewis found time spent walking in the countryside to be invigorating. It was renewing, for body, mind and soul. Several years back a book was published with the peculiar subtitle, The Environmental Vision of C.S. Lewis. The authors of Narnia and the Fields of Arbol explores the way Lewis displays his “ecological” concerns, particularly in his fiction. They also consider J.R.R. Tolkien’s similar attitude. It is no coincidence that these two men, as soldiers during the Great War, had seen the worst violence humanity could do to nature. The ravages wrought by the orcs surrounding Isengard were echoes of the lifeless terrain of shell-shattered Western Front. Writing this now, I recall a poem I wrote for Curtana: Sword of Mercy. their two imaginations envisioned greener lands. and colored portraits one day painted with their words. scarred earth stripped of all life. not even the smallest of creatures escaped death. It may seem ironic to some that those very fields now are green, and teeming with life. It is the mercy of God that restores the scarred and heals the broken. And, as impressive as those miracles are evident in nature, they are far more wondrous when it is human lives that are transformed and resurrected. So it is that I find the wonder of the barren and seemingly lifeless Saharan dust bringing nutrients to hungry forests on the other side of the earth amazing. No mere accident that. If Jesus delays his return and this globe continues to spin for more centuries still, I would not be surprised to see the Americas returning to Africa a similar gift of life. Weather.com has a short video about the Saharan Air Layer here.